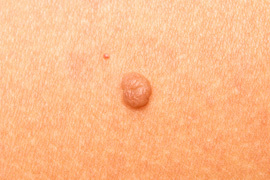 Moles, medically known as nevi, are growths on the skin that are usually brown or black. They can appear anywhere on the body, alone or in groups. Moles occur when the cells in the skin grow in clusters instead of spreading evenly throughout the skin. These cells are what give skin its pigment, so moles appear darker than the skin. Many moles will darken over time, when exposed to the sun, and during pregnancy. It is also common for hairs to grow on the mole. Individuals with lighter skin tend to have more moles than those with darker skin, and most people with moles have between 10 and 40. Moles are generally harmless, but it is important to know that melanoma, the most serious form of skin cancer, can develop in or around a mole, so knowing your moles is essential to catching signs of cancer early. Congenial moles are moles that a person is born with. About 1 in 100 people are born with one or more moles. These moles range in size, color and shape. Congenial moles that are considered large or giant are larger than 20 centimeters, and have been found to carry a greater risk of leading to melanoma. Known medically as dysplastic nevi, atypical moles are usually larger than average (more than ¼ inch), and irregular in shape. They may contain uneven colors, or colors not typical of moles. Atypical moles tend to run in families, and they carry the greatest risk of developing into melanoma. An acquired mole is one a person develops after birth. They are generally harmless, but people who acquire more than 50-100 moles are at greater risk for melanoma. If Dr. Keen tests a tissue sample and finds it to be cancerous, the entire mole and part of the tissue surrounding the mole will need to be removed. Or, if you would like a mole removed for cosmetic purposes, mole removal surgery is very common and usually painless. There are two ways to remove moles, and both can be performed in Dr. Keen’s office. Dr. Keen most commonly removes moles for cosmetic surgery in one of two ways: one is Radiofrequency mole removal and the other is Carbon Dioxide laser removal. Both procedures require only a small amount of local anesthesia and no sutures are required. Patients are usually very satisfied with the results because of little to no scarring exist and there is minimal discomfort both before or after the procedure. If you notice any of the above irregularities in your moles, you should contact Dr. Keen or your dermatologist right away. To further prevent moles from becoming cancerous, you should avoid the sun at peak hours, always wear sunscreen, and cover up moles with clothing when exposed to the sun.